Strawberries are probably the most popular of all summer berries. They are easy to grow and will reward a little care and attention with bumper crops all through summer. Strawberries are best planted from early autumn through to spring. Plant in a sunny position in well drained soil that has had top quality compost dug through it. 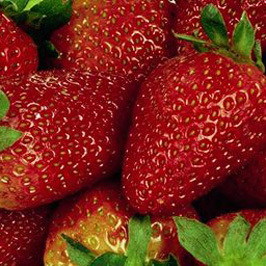 Strawberries can be grown in strawberry pots or other containers. Raise rows into mounds above the surrounding soil and cover in black polythene or pea straw. This helps suppress weeds and keeps fruit clean in summer. Place a handful of Blood & Bone under each plant and top dress with general fertiliser. Water well. Strawberries respond well to regular feeding. In the garden top dress with general garden fertiliser every 6-8 weeks or liquid feed more regularly. If growing in pots and containers use a slow release fertiliser such as Osmocote, and liquid fee every 7-10 days. Water regularly during the growing period. If strawberries are well fed and watered they shouldn’t be trouble by many pests or diseases. The most common disease is botrytis or grey mould, which appears as a grey fur on the fruit. Avoid watering directly onto fruit and spray with Bravo for bad attacks. Other things to watch for are Leaf Spot (spray with Bravo), and birds, for which bird netting is the best cure! All these varieties produce good sized, flavoursome fruit – Red Gauntlet, Tioga, Pajaro, and Aptos.